The TR1 Temperature and Relative Humidity Sensor is at the core of the standard Adcon combi sensor. It has a small cylindrical housing constructed from Tecapet, which has proven its superior corrosion resistance and robustness over more expensive aluminum cases. The tip of the tube houses two highly accurate sensor elements for temperature and relative humidity, while the center of the tube is home to a signal amplifier, converting the sensors output to a standard analog signal of 0 to 2.5V DC. The TR1 Temperature and Relative Humidity Sensors are virtually maintenance free and maintains its accuracy over a long periods. A threaded cap containing a wire mesh shield protects the sensor elements against dust, bugs and other possible pollutants. For applications which require special protection ( eg. against aggressive dust particles like ammonia in chicken sheds) an optional sinter cap is available. The new TR1 temperature and relative humidity (RH) sensor is a highly accurate sensor with excellent long-term stability for a very competitive price. 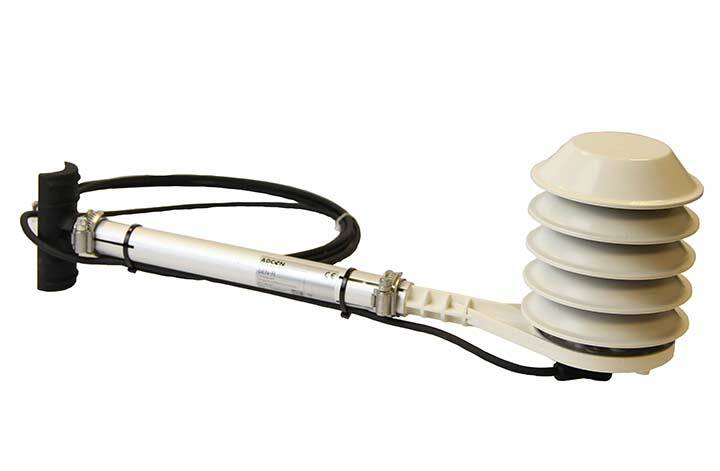 The SEN-R PRO HMP45A is Vaisala's top of the line relative humidity sensor. It conforms to the strictest meteorological requirements, in particular with respect to measuring relative humidity.